Boulder, CO (July 22, 2006) The Maine Forest Rally is one of the Rally America series roughest and most attended events. Based in Bethel, Maine, the event features tough gravel logging roads in Maine and New Hampshire that are infamous for their large rocks and tire killing conditions. For the Flatirons Rally Team the 2006 running of this long haul event was the first time they had competed, previously optioning to miss the event per championship rules. The event started on Friday with four Special Stages. The competition in the Production GT class was fierce at the front with teams trading seconds on every stage. True to form rival Hankook driver Matt Johnson was on the pace from the start, “we have been seeing some great battles this year with the leaders in the PGT class, but Matt [Johnson] really stepped it up these last couple of events and was really pushing us,” noted Foust. After the first four stages, and just under 30 miles of competition Johnson lead the Flatirons duo by just .7 seconds. Saturday morning saw the field take to the stages again. For the Flatirons Team the first stage each day was a major focus for strategy and X Games preparation. “The X Games Rally is going to require teams driving at 100% from the start, we wanted to really focus on starting days at 100% and I think we did that,” stated co-driver Crouch. On the first full stage on Friday the Flatirons team was able to beat rival Johnson by just under 12 seconds and were on pace to do so again on Special Stage 5, the first stage of day two. Special Stage Six was cancelled. Special Stage Seven was a reverse running of Special Stage Five. Again the Flatirons Team found rocks kicked up by other competitors, this time crushing the exhaust and damaging a front wheel. “No matter what we did we seemed to find the rocks on stages five and seven. On seven we hit what I would call a small boulder that managed to hit the inside of the front right wheel breaking that and another that crushed the exhaust. 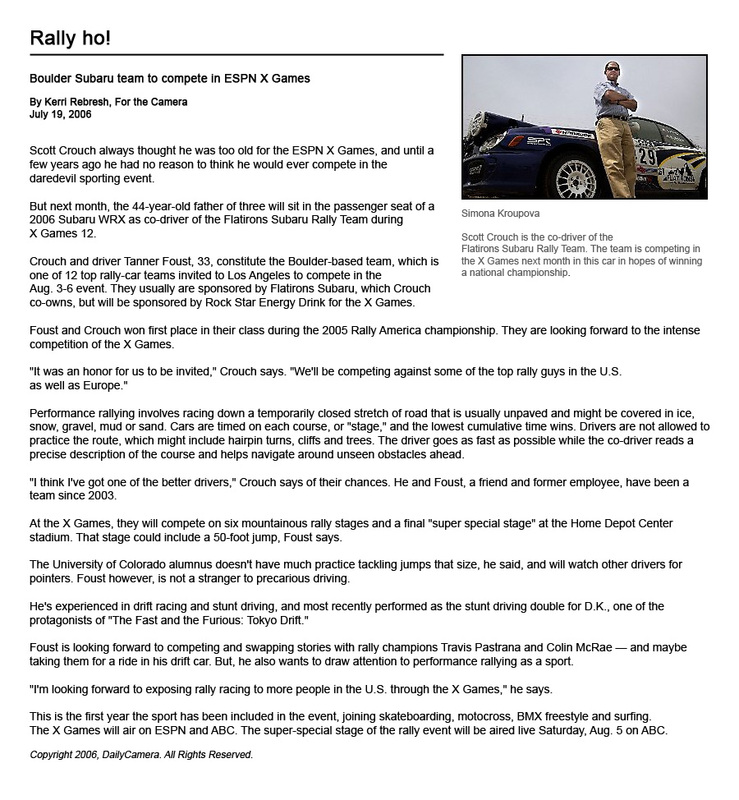 The amazing thing was while we were hitting rocks bad enough to crack and break our rally specific wheels our Hankook rally tires managed to hold up and barely showed any damage,” exclaimed Foust. Special Stage Eight proved to be the clincher for the Production GT battle. While the Flatirons Rally Team had been able to survive their wheel and tire problems with only a loss of about 20 seconds, rival Matt Johnson wasn’t so lucky on Special Stage Eight. About half way into the 13.7 mile stage Johnson suffered a flat tire and wheel damage. Johnson tried to drive the rest of the stage hoping to minimize the lost time but he ended up going off the road solidifying victory for the Flatirons Team.